Hours ahead of their highly-anticipated reunion concert, news broke that Junoon would be returning to Dubai on February 14 to perform at the opening ceremony of the Pakistani Super League cricket tournament with Pitbull, Boney M and Fawad Khan. Was this weekend’s exclusive comeback a misnomer then? Mull over this briefly and it becomes clear that for a band with a track record as tumultuous as Junoon’s, it would perhaps be a disappointment if they didn’t live up to the hype. 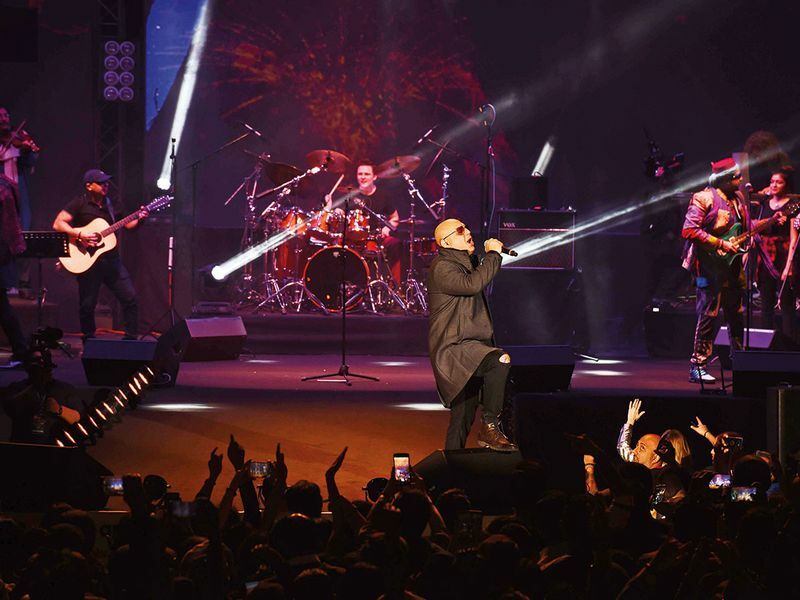 Returning to the Dubai stage after a 15-year hiatus, Junoon’s comeback holds bittersweet memories for the Sufi rock band who performed their last international concert on these very shores before embarking on their individual journeys. 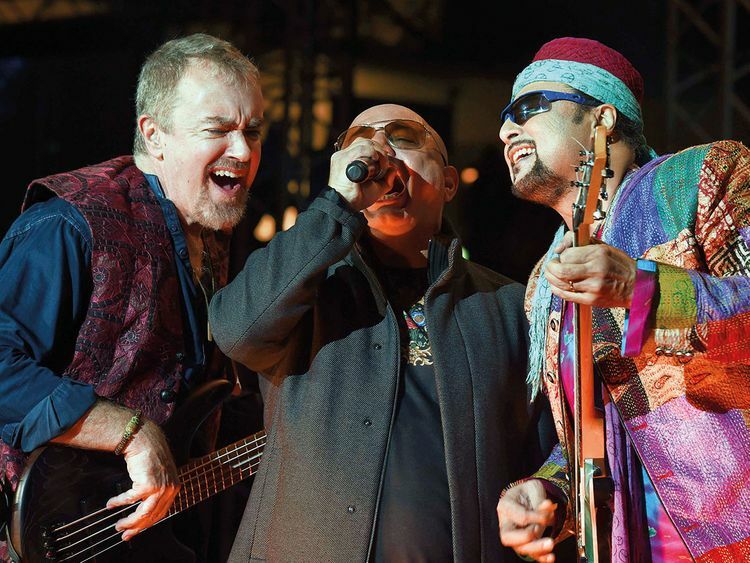 While lead singer Ali Azmat chose to pursue his solo music career, band founder and lead guitarist Salman Ahmad spent seven years teaching music in Queen’s College. Meanwhile, Ahmad’s childhood friend and Junoon’s bass guitarist Brian O’Connell found solace in social work, while making his own way in music. To have these individual paths cross again was no easy feat; for them to rediscover the synergy in their music speaks volumes of their talent. 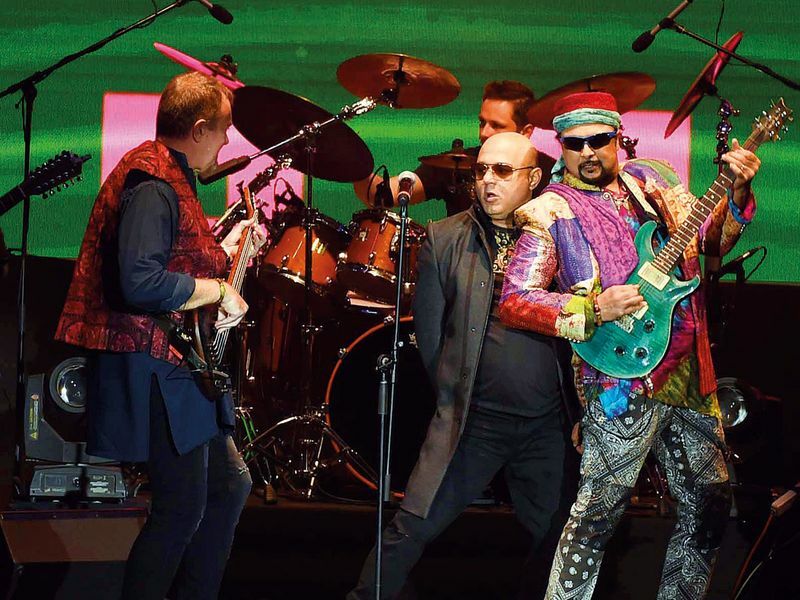 As the trio took to the stage at the Dubai Duty Free Tennis Stadium on the chilly evening of January 18, it was their unified effort that shattered the time and space barrier to transport the 6,000+ crowd back two decades when Junoon was at the peak of its musical odyssey. The evening kicked off (refreshingly on time) with Junoon hitting the notes of ‘Zamane Ke Andaz’, penned by the legendary poet Allama Iqbal and taken from the band’s sixth studio album. The track seemed the ideal choice for the band’s opening, considering it had peaked on the Southeast Asian charts in the Gulf when it released back in 2001. The track is also noteworthy because it was one of the few songs that Junoon experimented with in an effort to move away from its signature Sufi sound. Fast forward to the present and the concert soon drew the first of many electrifying crescendos when early into the evening, Junoon hit the high notes of ‘Sayonee’, a track that catapulted the band to newfound fame in 1997 when its fourth studio album dropped, titled ‘Azadi’. ‘Sayonee’ was a breakthrough for Junoon in many ways, ultimately leading to the band’s historic tour across India. The Sufi sound at the concert was an underlying thread that saw many highs, including a touching tribute to the musical genius of the late Nusrat Fateh Ali Khan. 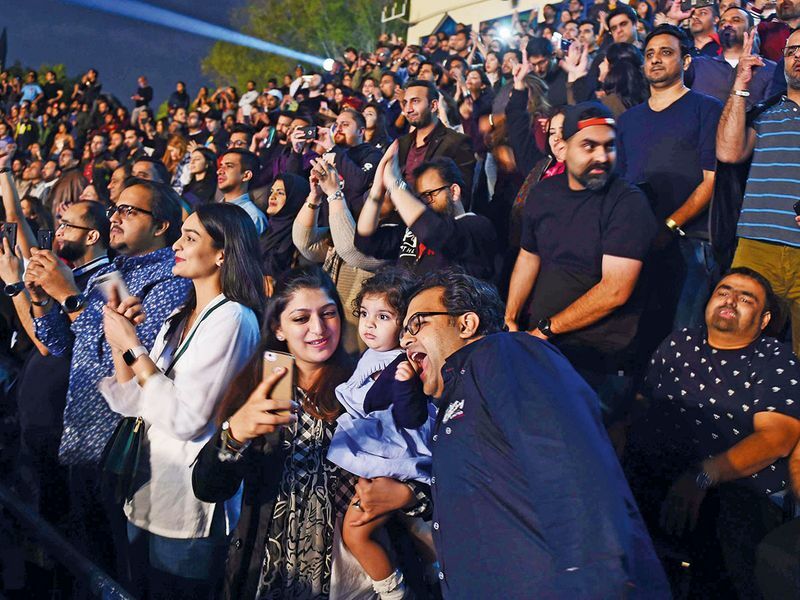 But it was an hour into Junoon’s performance on the night when the band, fuelled with energy that would be the envy of many in their 50s, found its rhythm with a triple treat — ‘Khudi’, ‘Saeein’ and ‘Lal Meri Pat’. Energy seemed to flow out of Azmat and Ahmad as they leaped across the stage, seemingly charged by Iqbal’s penmanship that forms the backbone of ‘Khudi’. With Ahmad’s guitar riffs allowing the music to flow seamlessly, Azmat channelled the highs and lows of ‘Saeein’ before launching into the familiar chords of ‘Lal Meri Pat (Dama Dam Mast Qalandar)’. While its origins go further back, it is the 18th century adaption by poet Bulleh Shah that has oft been adapted and repackaged by generations moving forward. The spiritual Sufi ode appeared to put Ahmad in a trance, as he spun with abandon, letting the music flow from his fingers into the guitar while Azmat voiced the poetry with passion. Few could argue that this moment was by far the highlight of the evening. The proceedings slowed down following the mesmerising performance as the band took a break while up and coming artists from Pakistan’s ‘Coke Studio’ took to the stage at the voices of a new generation. Twenty minutes later and with renewed energy, Azmat returned to the stage to launch into ‘Yaar Bina’, ‘Pappu Yaar’, ‘Garaj Baras’ and other popular tracks that wrote Junoon’s success story. Approaching the end of the band’s 140-minute performance, the night’s second and third highlights came almost back-to-back as the band launched into the opening chords of ‘Dosti’, the song that gave the band recognition in Pakistan, followed by its anthem, ‘Jazba-E-Junoon’. 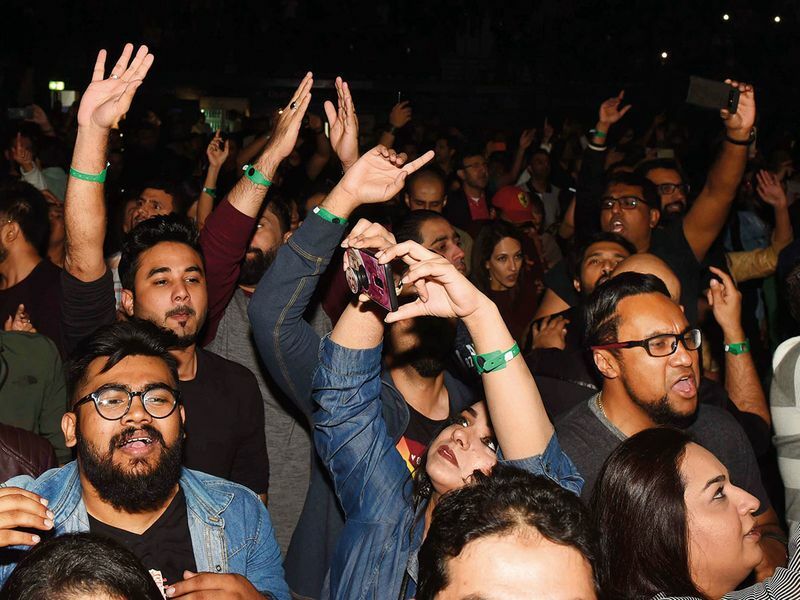 As the crowds launched to their feet, matching Azmat’s every lyric with gusto, the incredulous expressions on many a face told its own story, because truth be told, not many expected Junoon’s passion to hold as strong as it once did when the band ruled charts and hearts. But watching the trio create magic on stage is testament that real passion can never be erased.